Inside Texas Politics provides students with an exciting insider's perspective on the world of Texas government. Its focus on how power struggles have shaped Texas institutions and political processes offers students a fresh perspective that differentiates itself from all other texts on the market. 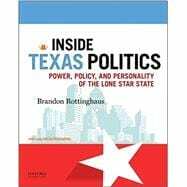 Rottinghaus' anecdotes make Inside Texas Politics fun and relevant for today's students, and his visual representations of data foster the skills students need in order to understand and think critically about the political world around them. Brandon Rottinghaus is an Associate Professor of Political Science and the Senator Don Henderson Scholar at the University of Houston. --The 1861 Constitution -- "The Confederacy Constitution"
--The 1866 Constitution -- "The Readmission Constitution"
--The 1869 Constitution -- "The Reconstruction Constitution"
--How Can Voter Turnout be Increased? ----Great Texas Political Debates: Should Texas Have Annual Legislative Sessions? ----Great Texas Political Debates: Sunset Sunset? ----Angles of Power: Two Supreme Courts? ----Great Texas Political Debates: Ban the Bag?